'Casa Nuestra' - Private 3BR Luxury Home with Your Own Pool! It is a THREE BEDROOM, THREE BATH, PRIVATE HOME with an L SHAPED POOL, situated in the PRESTIGIOUS 'CORPUS CHRISTI' section of the island of Cozumel. It has recently been purchased by an American family who has completely renovated - and 'AMERICANIZED' it! The 'L' shaped TILE POOL goes from (3')to(5')in depth with a bench along the deep part where you can enjoy a drink or read all day. It is surrounded by a BACKYARD PATIO and EATING AREA that is landscaped with tropical plants and flowers and a GAS BAR-B-QUE is provided for your grilling pleasure. There is full exterior lighting on the patio and pool area, plus the pool is equipped with an underwater light, making your nighttime dip even more pleasurable. A scuba diving/snorkeling equipment RINSE TANK is featured in the front courtyard, along with an EQUIPMENT DRYING AREA. There are two bedrroms located on the second floor: The MASTER BEDROOM feaures a king-sized bed and its own PRIVATE BATH, while the adjacent GUEST BEDROOM has a queen sized bed an its own PRIVATE BATH. The downstairs GUEST BEDROOM has a full sized bed. Each bedroom is equipped with its own TELEVISION, individually controlled AIR CONDITIONER and imported CEILING FANS. All bathrooms have LARGE TILED SHOWERS. The DINING ROOM seats eight and there is a FULL MODERN 'AMERICANIZED' KITCHEN including stove/oven, refrigerator, microwave, blender, toaster, electric juicer, cookware, untensils etc. The LIVING ROOM has three couches (one a queen sized futon) and holds an extensive VIDEO LIBARY, VCR, STEREO CASSETTE/CD PLAYER, BOOK LIBRARY and GAMES. A CLOTHES WASHER has been added for your conveninece. Accommodations for SIX are very comfortable but can be used by EIGHT. Cooled BOTTLED WATER is provided and MAID SERVICE is also included. Tasteful island decorations; Mexican rustic furniture upholstered in rich colors, original oil paintings and hand crafted wooden furniture and armoires were used to give this home its warmth and charm. Our local PROPERTY MANAGER will meet you at the airport, and is available to assist with any questions or arrangements necessary and introduce you to the nuances of 'OUR HOUSE'. For more photos and information-please access Owner's website- see 'LINKS TO MORE INFORMATION' below. From the rooftop entertaining and viewing area. Remote controls for each unit. In addition to sheets and bath towels, beach towels are also provided. (4) In the living room entertainment center and in each bedroom. Rooftop entertaining & viewing area. Property surrounded by 8' privacy wall. Lounge Chairs, Beach chairs, Umbrella and cooler, Scuba/Snorkeling equipment rinse tank and drying area. The water system is pressurized for strong showers. Hair dryers and makeup mirrors in each bathroom. Iron and Iron Board. Maid service-Tuesday,Thursday and Saturday. We had a great time, house had everything we needed, and more. The dogs across the street bark alot at night, that was the only negative. Please understand that the people of Cozumel use Dogs as their Alarm systems. That is one of the reasons that our neighborhood is so safe and crime free! We enjoyed stayin at Caa Nuestra. When we arrived Patty was there to greet.us and helping get us settled in our home for the week. She even helped us with getting my sister and husband from the ferry, when the taxi driver could not find the house. The beds were very comfortable and the bathroom updated. plenty of hot water. The only down fall which is not the fault of the owners were the dogs across the street that barked all night! Cozumel needs to in force a tax on dogs maybe then there wouldn’t be so many. We enjoyed the roof top terrace. The pool was very nice but if it was heated would be helpful as the sun does not it hit it till later morning. Thank you for sharing your home with us. We love, love, LOVED this home! It was perfect for our family. We enjoyed exploring the town during the day and watching movies before bed from the huge movie collection. The breeze was absolutely spectacular moving through the house and I really enjoyed reading a book on the roof as evening approached. There was not a single thing that needed that was not already there. So glad you were happy with the accommodations! Our own private get away. 3 bed,3 bath and pool. A 20 min. walk to town which isn't bad really. Or stop a cab and for less then $5.00 us. you can go anywhere you want. The house is outstanding. Very clean it felt like home. We loved it. My family & I had a great weeks vacation at this property. We couldn't ask for a better place to stay & enjoy Cozumel, the house, the owners & property manager were wonderful.The pictures on the enternet were so accurate, the house & grounds were everything we hoped for & more, it is scary renting a place by pictures only. It was my birthday & the kids arranged with the owners for a marachi band playing happy birthday as we entered the house, what a great surprise! The only down side was the barking dogs late at night & very early morning hours.. I would very much stay again, but with ear plugs. I want to recommend The Lobster House, it is a small restaurant, homey & has the best Lobster & Keylime Pie on the Island, actually the best I've ever had.. I do recommend this property, I know you'll love it as much as we did!! Thank You, for a wonderful vacation & birthday with my family!! Thank you for your review. We are glad we could accomplish your Birthday surprise and that you found our house just as you expected and more.We and our property manager try to make your stay a unique experience that affords our guests the true feel of living in Paradise. 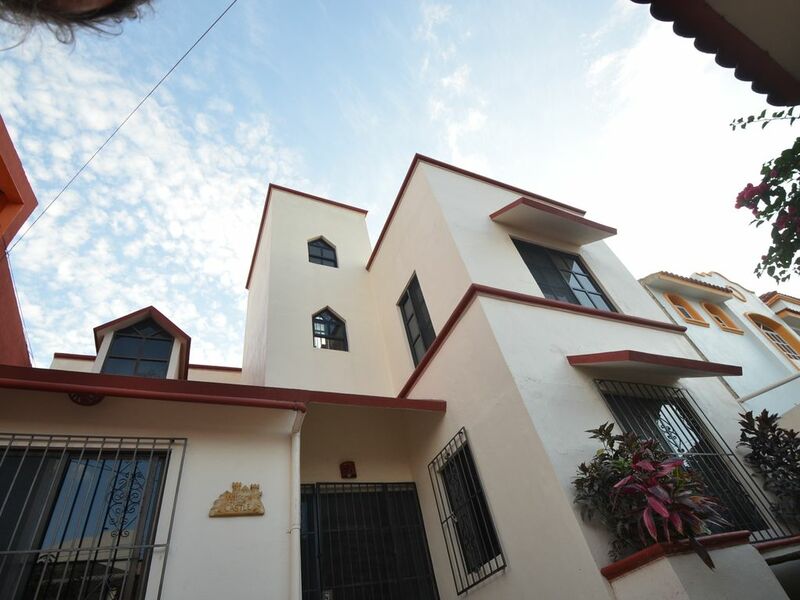 Casa Nuestra was clean and comfortable, and located close to the ocean and shopping. Best of all, management took excellent care of us and the property during our stay. Thanks! We and our staff try our best! Glad you enjoyed "Our House"! Mayan Ruins, Secluded beaches, Ecological parks, Helicopter tours, The Mayan Rivera, Xcaret, Xplor & Chakanaub Parks!